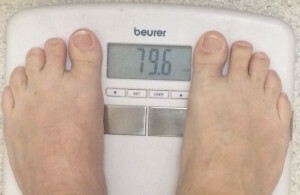 I wrote last year in August about a bet (can be found here), to drop 5 kg down in weight which was achieved pretty quickly, on the 13th of September, just a month after the bet I wrote about it (can be found here). Finally I reported in November that I got be low 85 kg (can be found here and later here). I then expected to drop down 80kg in the first two but that didn’t happen. Most of the success with weight loss was mental and also to change to Low Carb eating. Sure it was a big change food-wise but I haven’t felt that great for many years, more energy and the pleasure of seeing the weight drop regular. Starting doing fitness, both home training (body weight training) but also joining a great Gym was success for me. Signing up for Spartan Race in April was also a great feeling, that I was going to take part in a event. In the past it was friends or people I worked with who did various events but suddenly it was ME. The motivation I got to train and participate in the race was great, unfortunately it didn’t work out as I hoped (see my Spartan Report here). One big setback was the knee injury I suffered early February (report after 6 weeks can be found here). This limited both my level of security at the Spartan Race and also limited how much I could train up to (and after) the event. But at least things are progressing very well and I’m still aiming for the 2016 April race. I was around 81-82 kg for a long time but first after my knee operation I dropped below 80kg. Hard to say how much was due to muscle mass that I lost during the 6 weeks where I couldn’t use the leg. I’m now allowed to use the leg with full weight and so far no change in weight. I have stayed on low carb most of the time but during the 6 weeks with crutches I failed often in the evening, too much hassle cooking when not been able to move freely around the kitchen. Now things have changed, I’m walking 100% without crutches so I’m back to normal low carb cooking. I do fail from time to time (Not that I consider it failing really), such as when my son bought cake home from the bakery where he works :-) (Highly appreciated). But the other days are from 1400 to 1800 kcal and below 50 gram of carb, with around 90-140 grams of protein. I’m trying to follow the “30 within 30” (Check Tim Ferriss blog entry, check point #6 or read his 4 hour body book). So 30 grams of protein within the first 30 minutes of been awake, unfortunate I’m slow in the morning and need my shower before I do anything but still try to get at least 30 grams of protein at breakfast. 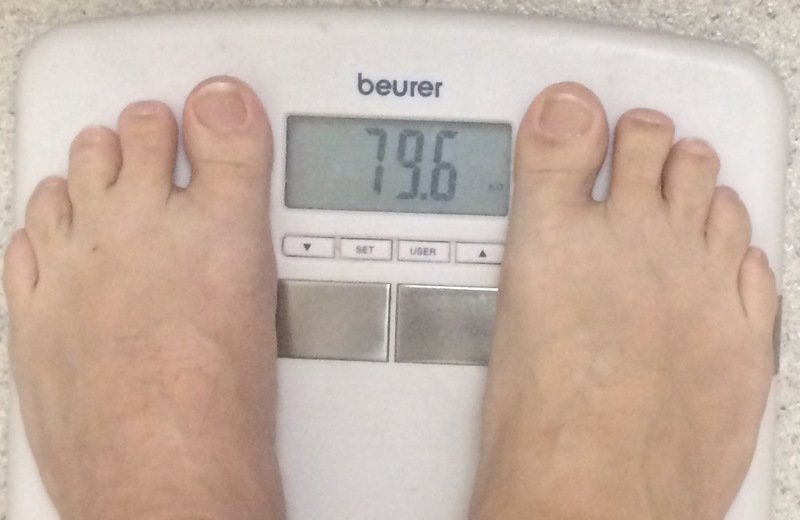 The last few days my weight has been hovering around 79kg (plus minus 200g). I thought I would be excited when I saw < 80kg but I didn’t, probably because I expected it to happen with loosing muscles. Current weight, got to say this was after a nice big breakfast and mid day. I’m now aiming for 75 kg that I don’t think will be a big problem, dropping 5 kg from a steady weight is doable. Sure it will require focus, stricter low carb and even more fitness but I’m ready for all that. It will only do my good in the long run, so lots of motivation. Dropping more weight will make fitness more enjoyable, it will make Spartan Race easier (it will never be easy). Only bad side effect, I will need to buy new cloth. Already went from size 38″ jeans to 34″ (Used to be 30″ in the past, like 18 years ago). But that’s a side effect I happily take. I do have some specific goals in mind but I need to refine them a bit and make a plan on how to reach them, so that will be for another blog post.